Need a break but not sure of where to go next? Check out Skyscanner's 'Everywhere' search to fuel your wanderlust. 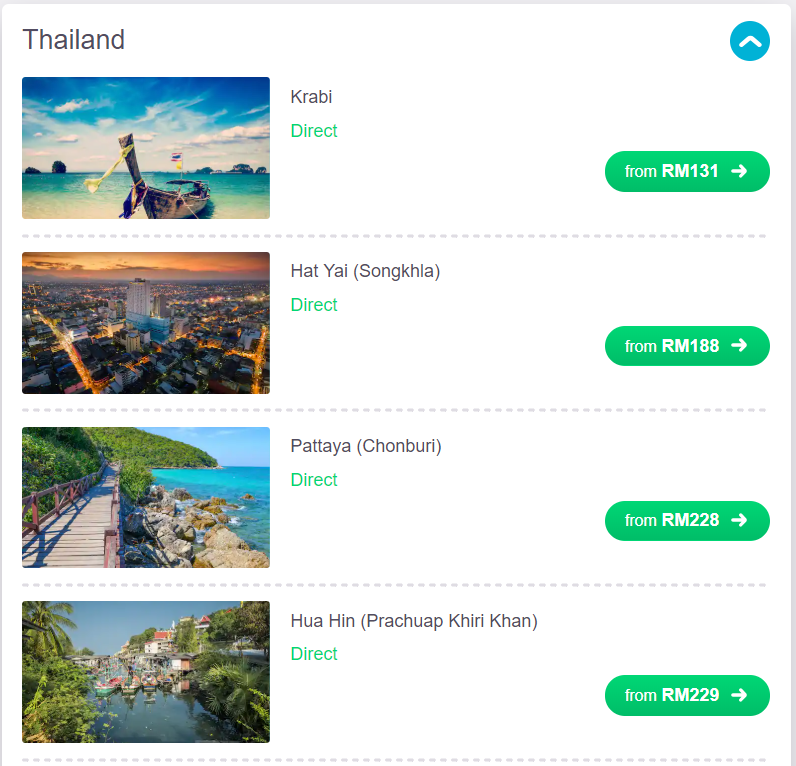 Find cheap flights to an array of holiday spots departing from Malaysia, and with a few clicks, you're as good as there. Simply follow our tips below and planning your next trip will be a breeze—almost as breezy as that beach hammock with your name on it. 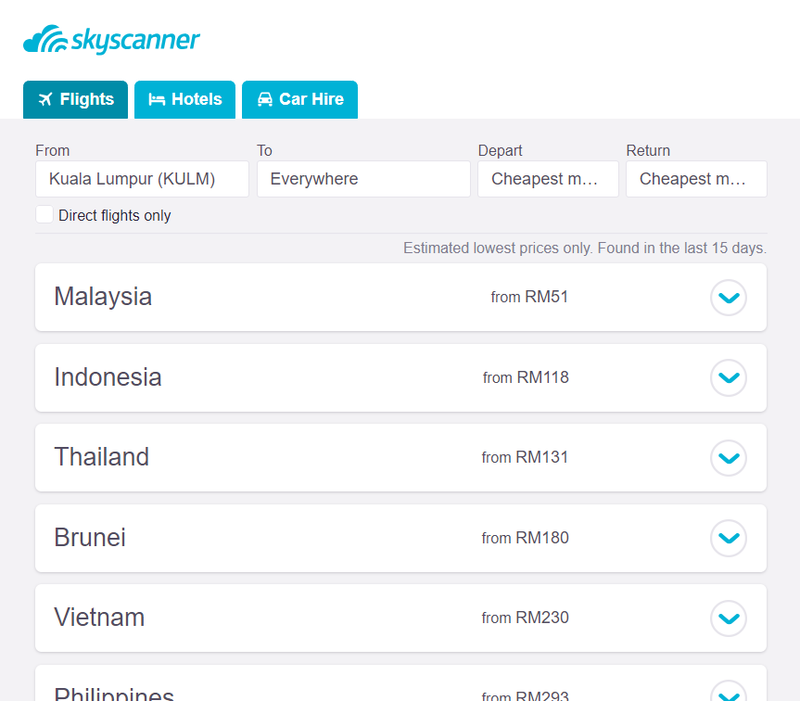 How to use Skyscanner’s ‘Everywhere’ search? Input your most convenient airport to depart from. At the Skyscanner homepage, click on the ‘From’ box and select your nearest airport as your departure point. The screenshot below uses the Kuala Lumpur airport as an example, but if that is not the best airport for you, you can select one that is. If you’re not sure, you can also type in the name of your closest city, or even “Malaysia” for broader results! Now click the ‘To’ box to the right. You might see a drop-down option that says ‘Can’t decide where?’ That’s the one we’re looking for! Click that (or if there isn’t a drop-down, just start typing “Everywhere” and you’ll see it) and we’re halfway there! 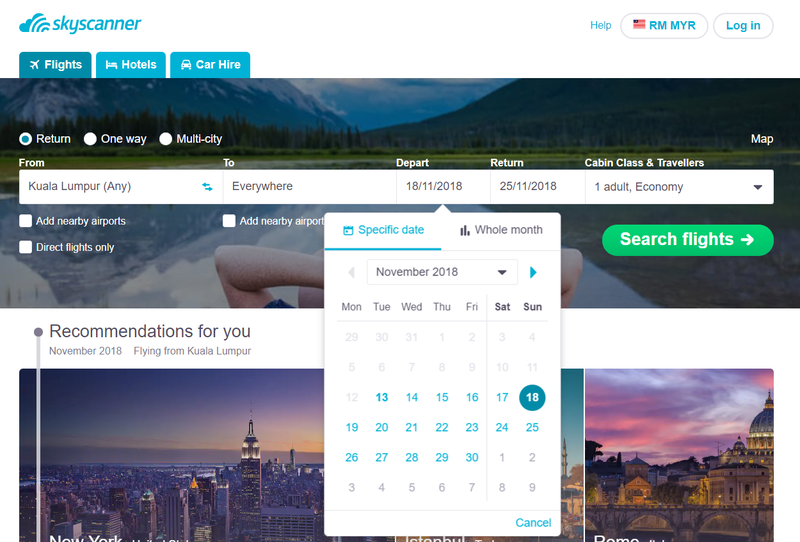 If you already have some travel dates and/or number of passengers in mind, Skyscanner’s search allows you to enter those for more accurate results. Click on the ‘Depart’ box and you’ll see the option to enter a Specific date to depart on. And you can do the same for your ‘Return’ date. If you have slightly more flexibility, give the Whole month feature a try, and you’ll be able to compare many flights by each day in a given month. And lastly, if your travel dates are super flexible, the most budget-friendly search would be to find the Cheapest month in a year for the absolute best prices and cheapest flights. Once you are done, simply click the Search Flights button below in green, and Skyscanner’s smart algorithms will match your search criteria and comb the internet for the best deals on flights, just for you. After you’ve entered your search, Skyscanner will look through all its databases and give you a list of countries you could fly to and their respective flight prices, sorted with the cheapest on top. Click on the country that sounds the most tantalizing to you, and the results will expand to show you the cities in that country you could fly to, as well as with a further breakdown of flight prices for each destination. And once more, select the city you want, and you’ll get results for various flight times and carriers, with the cheapest flights automatically sorted at the top. Once you’ve picked a destination city, you can narrow down your search even further with some nifty search filters. If you like snoozing on the plane and waking up at your destination ready to paint the town red, then adjust your preferred flight time to leave at night and arrive in the morning. Used together with the other search filters for picking a flight by duration, airline carrier, and even number of transfers, finding your perfect flight itinerary just got a lot easier. With this convenient Everywhere search, what are you waiting for? Your next awesome vacation awaits, wherever it may be! Did you know that you can also use Skyscanner to search for hotels and car rental best deals for easy planning, all in one place? Have some ideas of where to go, but nothing right now fits your budget? Then subscribe to Skyscanner’s Price Alerts feature to get alerted whenever there are changes in flight prices. So now you can stake out your dream flight and strike when tickets are the cheapest! Read more about how to sign up and how Price Alerts works in this useful guide. Any prices shown are accurate at the time of publishing and is subject to change and availability.